I the Governor aforsaid do give and hereby grant unto him the said John Trimingham this my Letter of Marque and Instructions herewith given hereby authorizing him as captain and commander of the sloop or vessel called the Larke now outward bound unto Virginia to resist, oppose, pursue, subdue, take, sink, burne or otherwise destroy all and every other subjects of the Crowns of France and Spain and all others being Enemies to her said Majesty the Queen and her subjects with all and singular their effects, vessels, goods and merchandises whatsover which he the said Capt. John Trimingham shall happen to meet with. And this during my pleasure only. And he is to have a due regard to the laws of Nations and all sacred statutes and ordinances in such as made and provided given under my hand and the publick seale of Admiralty of these islands the six & twentieth day of May in the year of our Lord 1704. And in the third yeare of the reigne of my Sovereign Lady Anne by the Grace of God of England Scotland France & Ireland Queen Defender of the faith etc. 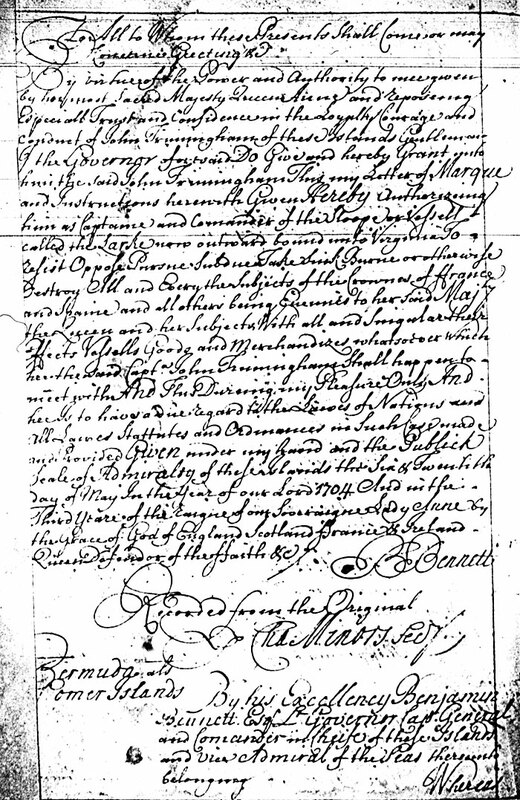 This letter of marque was issued to John Trimingham, ca.1669-1735, in 1704 by then Governor Benjamin Bennett, making John, in essence, a privateer - a private ship and its captain and crew operating under a letter of marque. This was common at the time, with ships of various nations preying on each other. The wording at the beginning is common in court and government documents of that time and the words "these presents" refers not to the people present, but to the document itself. This was a copy of the original document, recorded in the Book of Commissions, 39A, 1700-1710. John Trimingham (President John, Col. John, or John II) was the father of Catherine Trimingham who married Capt. George Brent of Woodstock, Stafford County, Virginia. They were my 5th great grandparents. Bermuda Archives, Microfilm Reel 70, Book of Commissions, p.20.